It’s a day to celebrate all the joys of quilting! One of the ETSY teams I belong to issued a challenge: Make something based on your first ever quilting block. 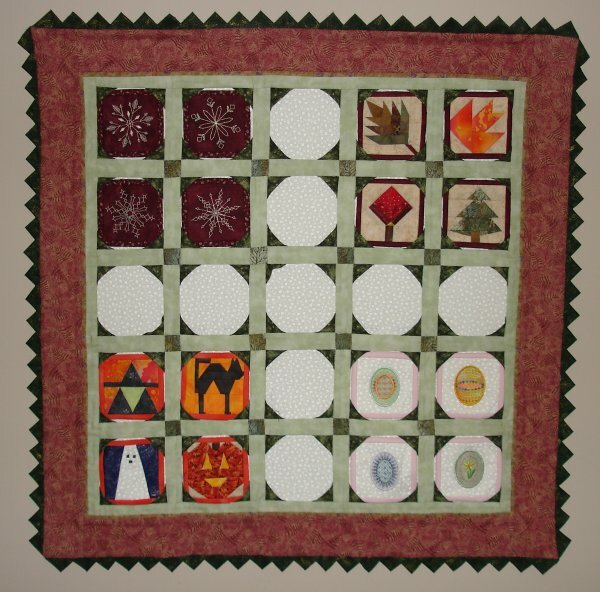 The first quilt I ever made was a rag quilt (and I still love making rag quilts), so there were no pieced blocks – just squares stitched together. I had seen one at the quilt shop where I was taking machine embroidery classes. 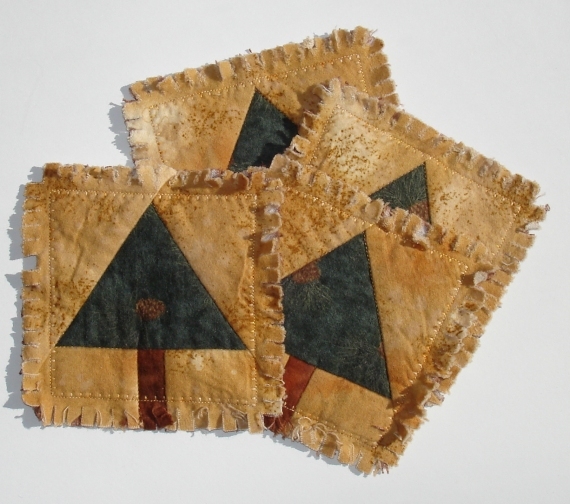 Machine embroidery designs were used to “quilt” the squares before they were stitched together and the blocks are sewn with exposed seams, which are clipped so they fray out when washed. Without needing accurate 1/4″ seams, I figured that this was a project for me! I’d post a photo but i realize I don’t have one – and the quilt is at the cottage now and I’m at home, so I’ll have to wait until we’re next there…. 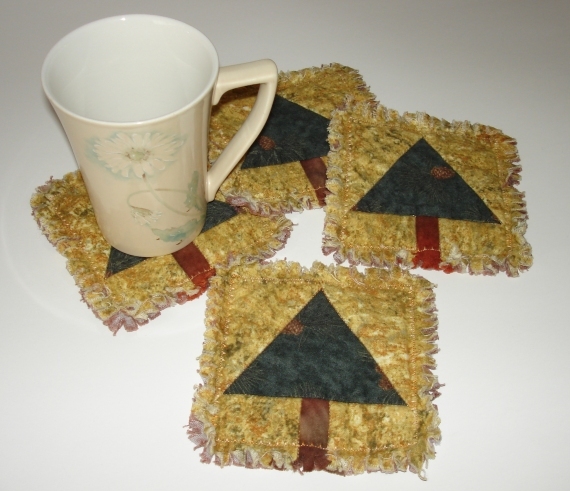 Anyway, to get back to the Worldwide Quilting Day Challenge, I decided to make some rag-quilt coasters using that paper-pieced tree block. They actually sold this week in my ETSY shop, so I made another set, too. To celebrate quilting today, I’m working on a challenge project. 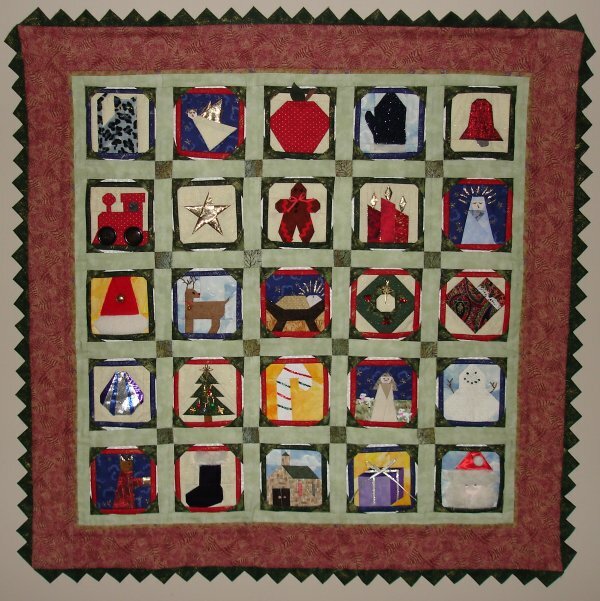 Are you celebrating quilting today? A love of stitching has been inherited from my mother and grandmother. I can’t remember a time when I didn’t have at least a couple of stitching projects underway. Whether it’s by hand or machine, there are always new projects I’d like to try or fibres I’d like to experiment with…and a few projects waiting to be finished! This entry was posted in ETSY, Quilting, Worldwide Quilting Day and tagged Celebrate Quilting, ETSY, first quilt block, Worldwide Quilting Day. Bookmark the permalink. Ontario's premier outdoor quilt show!